Aeronautic is a word which discovered by the combination of two different Geek Words " Aer + Nautike". Meaning of "Aer" is the " Air "And meaning of the "Nautike" is "Navigation Of The Air".Aeronautical Engineering is a division of Aerospace Engineering, Aerospace Engineering is an engineering course that mainly deals with the field of engineering and related to the development of aircraft and spacecraft. It consists of two major and overlapping branches: Aeronautical engineering and Astronautical Engineering. Aeronautical Engineering is a course that primarily deals with the Airplanes, Jet Planes, Aircraft, Space Shuttle etc. Aeronautical Is also considered as " Sailing The Sky ". Those students who choose Aeronautical Engineering have to study Manufacturing of flight-capable machines or the techniques of operating aircraft. They work with the theory, technology, and practice of flight within the Earth's atmosphere. It supports development of new technologies in aviation and defense systems. So those students who are interested in jet planes, spacecraft etc. they can apply for Aeronautical Engineering. 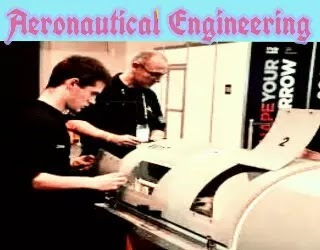 The duration for UG Degree Aeronautical Engineering usually of three to four years, but this duration varies from institutions as their various institutions allow students to progress directly into a Masters in Aeronautical Engineering, due which duration for this course gets an extension for an additional year of one or two. In Various Cases, B.Eng. and M.Eng. students chose the same courses only for the first two or three years, and some students those give their best performance, they continue with B.Eng. for one year or for two years with the progress of more advanced M.Eng. Doctoral degree courses leading to the Ph.D. domain with the duration of 1-2 years after the completion of PG degree in AE. Those students who choose Diploma Course in Aeronautical Engineering have to study for duration of 3 years. In order to comply with the eligibility criteria of Aeronautical Engineering students must complete the 12 standard examinations from the recognized board. In 12 the standard students must choose Physics, Chemistry And Mathematics Subjects. And also must score 50 percent marks in 12 the standard examination. For those students who want to get admission in a reputed college, they must also score well in National as well as state-level common entrance tests. Students must have sharp mind for Understanding written sentences or paragraphs in work related documents and also have abilities to identify the strengths and weaknesses of alternative solutions, conclusions or approaches to problems. Students must have ideas related to apply various scientific rules and methods to solve the problems. Students have deep listening power and must have the ability to provide their full concentration on what they listened by people, taking time to understand the points being made, asking questions as appropriate, and not interrupting at inappropriate times. Students must have well communication power to communicate with others in an effective manner. Students must Communicate effectively in writing as well as in speaking as appropriate for the needs of the audience. Students must have the ability to identify the various complex problems and must have the knowledge related to these problems and methods in a manner to get the solution of problem easily. Students must well Analyzation ability based upon needs various requirements or demands in order to manufacture an effective design in accordance of requirements. Students must have Monitoring ability for various actions performed by yourself as well as others including individuals, organizations or their groups. Those students who passed the 12 the standard examination from a recognized board can get admission for Aeronautical Engineering. If you want to get admission in the admission procedure of the graduate courses (BE/B.Tech) is based on the merit of senior secondary school education. If you got to study in English as a primary language and you are an international student, you must have to prove your proficiency through a standardized exam such as IELTS or take an English language course prior to commencing your degree in order to obtain a student visa or entry into the program. Entrance to the IITs is through 'JEE' (Joint Entrance Exam). The duration of the course extends up to four years. If you want to get admission in engineering course then must crackJEE Main's examination in order to get the admission.F or admission to PG engineering courses like M.Tech candidates have to appear in GATE 2018 exam. The students who had a B.Tech degree in electrical engineering, electronics engineering or mechanical engineering are eligible to get the admission in M.Tech with aeronautical engineering.